January 2016 ServerPress Newsletter • ServerPress, LLC. We were a little poky in getting the January newsletter out, but we wanted to be able to include with it the first of our 10 upcoming video tutorials from Zac Gordon. If you remember from our last newsletter, we announced these were forthcoming. Well, we’re happy to say that after a lot of hard work, the first video is ready for release. 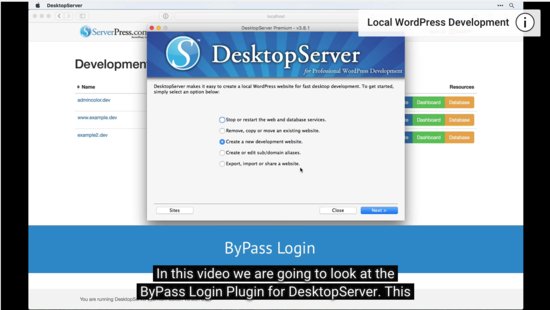 As mentioned in the intro paragraph, we are excited to release our first DesktopServer Developer Plugin Video Tutorial. You can view the video on YouTube and read the accompanying documentation. We’ve taken a few extra steps to make the video accessible with a long text transcription and closed captioned option. We pride ourselves in providing solutions to many developer woes. Being able to bypass the login has been an awesome feature for some of our current users and we’re almost certain you’ll love it as well! Over the next couple of weeks, as we finish polishing up videos, we will send them straight to your inbox. We hope you find these videos helpful in learning how to extend the functionality of DesktopServer Limited and Premium versions. Learning to use these developer plugins will help you develop a strong local development workflow and iterate your sites faster and cleaner. Congratulations, Alex Juchniewicz, Our December Giveaway Winner! We are happy to announce that Alex was selected as the winner of our December “Learn How to Do Your Job” Giveaway! With a prize package worth over $400, we hope Alex can leverage the tools and resources for a bright 2016. Congrats again, Alex. Thanks for entering our contest and we can’t wait to hear how your prize winnings changed your life! We’ve been working behind the scenes on some content restructuring. While digging into the nuts and bolts of it all we discovered how far reaching our community has grown via community created tutorials, how-to’s, and developer tool reviews. 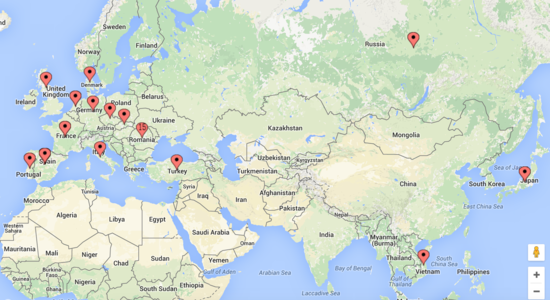 How cool is this map showing all the countries where people have written DesktopServer tutorials in their language?!? We’ve started pinning “WordPress Sites Built with DesktopServer” to it’s own board in our Pinterest account. If you’d like to see some other projects that have been designed, developed, and deployed with DesktopServer, come check it out. We just started pinning these sites last week and already have over 50 pins set up. We will add a pin every time we complete an assisted deployment (which is a feature available to Premium members.) We are looking forward to sharing these pins (your sites!) across social media. If you have a website you’d like us to add to the board, please contact us and follow us on Pinterest – we’ll be adding lots of new content to our boards all year long. Marc, Gregg, and Sarah will all be down in Miami for one of WordCamp’s most notorious events! From a beginner’s workshop on Friday to a kids’ panel on Sunday afternoon, this WordCamp has something for everyone. Marc will be speaking on Friday and Sarah is scheduled to present on Saturday. (Please note this schedule is subject to change.) Gregg will be manning the booth. Be sure to grab a ticket if you haven’t yet. Tickets will definitely sell out as we get closer to the date. We’re excited to see many of you in Miami! Gregg is headed to Pressnomics! We grabbed him a ticket at the last minute and as of this publication, Pressnomics is completely sold out. You can join the waiting list and if a ticket becomes available you will receive an email. Pressnomics is touted as “The conference for those that power the WordPress Economy.” This will be our first year attending Pressnomics – we can’t wait to see what all the buzz is about. Looking for a DesktopServer Coupon? Then look no further than the Friends of Pods Rewards and Partner Perks program! We are happy to support The Pods Foundation by offering a 20% off discount code to Friends of Pods members. The Pods Framework rolled out an exciting new program called Friends of Pods this past spring. For as little as $5.00 per month you can help support the important work going on to support and continue extending The Pods Framework – and keeping it free! Friends of Pods receive access to special coupon codes and discounts to major WordPress tools and software on their partner page. Consider becoming a Friend of Pods today and have access to their unique 20% off DesktopServer Premium coupon code! That’s a Wrap for January’s News! Thank you for reading the newsletter and being a vibrant part of our DesktopServer community. We appreciate each and every one of you – now get out there and make some money! previous post: Learn to Do Your Job in 2016 Giveaway!